Gloria Ward, president of the American Hydrangea Society, told me the other day that she saw one of my photographs on Pinterest. It was a viburnum, not this one, but a smaller one, Viburnum plicatum. But the person had it listed as a hydrangea. The picture of the one in question is in my book, Margaret Moseley's A Garden to Remember. Two cascading branches are covered with pure white flowers the size of tennis balls. I can certainly see why someone would think "hydrangea". The plants we call snowballs, though, bloom here in the South in March and April. Hydrangeas, except for the climbing ones, mostly bloom in June and July. Well, actually, the oakleafs are at their peak in mid-to-late May, and the paniculatas, the sun-loving ones, flower in July and August. I refer mostly to the ball-shaped and lace-cap macrophyllas (which can be purple, blue, pink, red and white) and the arborescens 'Annabelle' - these bloom primarily in June here. Gloria corrected the Pinterest pinner (I want to learn how to do this; someone set me up and gave me a lesson, and now I've forgotten what to do), noting that what they were calling a hydrangea is actually one of the spring-blooming genus Viburnum. 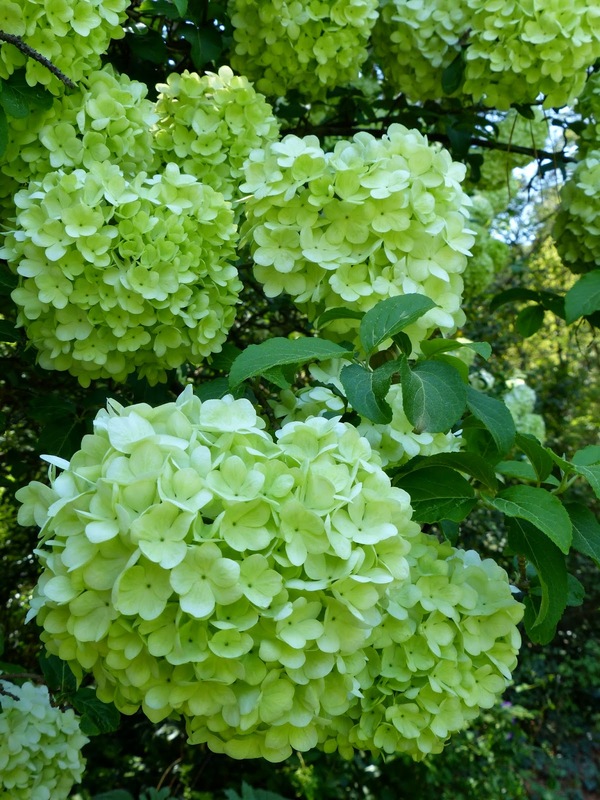 Pictured above is the green form of Viburnum macrocephalum, the giant Chinese snowball. Depending where you are around the city, the flowers of this shrub (which can grow as tall as 20 feet), are now turning white. I took this photograph in Margaret Moseley's garden last Saturday. This particular plant (she has several of this same species) was in a good bit of afternoon shade. It is likely mint green by now and could be white by the weekend. This coming Sunday is Easter, and at our church we decorate a wooden cross on the lawn with flowers brought from home. I groaned when I saw that Easter was going to be so late this year, thinking the azaleas and dogwoods - staples that fill up the cross (which is covered with foam oasis bricks) - would all be history. The last time Easter was late, Wendie Britt, the minister's wife, and I spent an hour during the first Easter service cutting scratchy 'Knockout' roses from the church property so we'd have enough flowers to cover the oasis. We laughingly called it the "Red Cross" that year. Thank goodness, I was wrong about the timing this year. The dogwoods are hanging on, and many of the Indica azaleas are just now coming into bloom. I won't need to go to my Jewish friend's garden to raid his rhododendrons, which normally bloom in late April, to put on the Christian cross. Best of all, I can take armfuls of Viburnum macrocephalum for the cross this year. I haven't been up to the little house in over a week, but I'm betting mine are almost white now and will certainly be by Sunday. I am also betting that people who gather to take pictures or watch as the cross is being filled with flowers, will mistake the oversized balls of this showy plant and will ask the question over and over: "Is this a hydrangea?"